Be it liquid, cream or paste: every product is different and thus demands a filling machine, that is made to fit. At Bünder & Schmitt no filling machine (filler) is alike. We design and construct each and every machine exactly according to our customers’ needs and specifications. More than 45 years of experience, know-how and creativity have made us a trusted partner of businesses from around the world. If you are looking for an engineering expert specialized in packing machinery, look no further – Bünder & Schmitt offers all you need! No matter what kind of product you are looking to package, we will provide you with a filling machine that works fast and reliably. Contact our customer support and tell us about your project. We will be glad to discuss your options with a custom made Bünder & Schmitt filling machine. You can reach us via email at info@buender-schmitt.de or by phone via +49.2252.835269 0. … fills up to 18,000 pcs/h. … allows for filling with or without workpiece carrier. … allows for production with very low noise levels. … allows for smooth adjustment of filling quantity between 2 and 20,000 ml. … will allow for rapid and simple retrofitting should you need to switch to other formats. … allows you to freely program all servo drives. 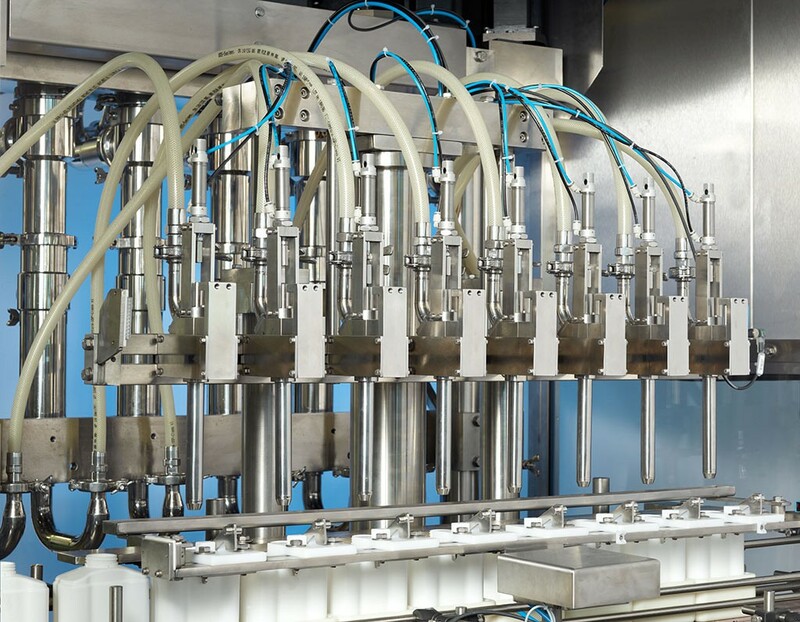 High production standards: Quality is our trademark – thus a Bünder & Schmitt filling machine will satisfy all of your demands and technical requirements. Since we produce most parts for our machines ourselves, the finished product is always a well-coordinated and well-calibrated piece of equipment. This is true of all our machines – fillers, capping machines and more. Strong performance: Time is of the essence – which is why a Bünder & Schmitt filling machine is made for high performance and absolute efficiency. Durable: Our fillers are made to last under heavy usage. Made to fit your needs: Liquid, pasty or frothy, bottle or tube – your filling machine is made according to your specifications. You want to learn more about a Bünder & Schmitt filling machine or other products (f.e. a pouch filling machine)? Don’t hesitate to call or write us an e-mail at info@buender-schmitt.de. We’ll be glad to get in touch and help you to get the filling machine that fits your needs.